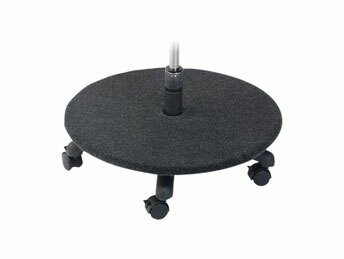 This carpeted ply board foot support base has been designed to ideally suit the needs of very small children. It also serves as a safety option for those with reduced co-ordination. The sitter can use the Bambach Saddle Seat without the risk of their legs being caught up in the five star bases, which would be under the ply board base. 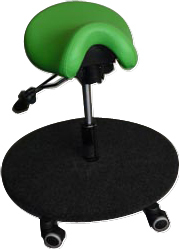 The base also stops the sitter from moving themselves around by pushing on the floor with their feet, a useful function in the classroom. 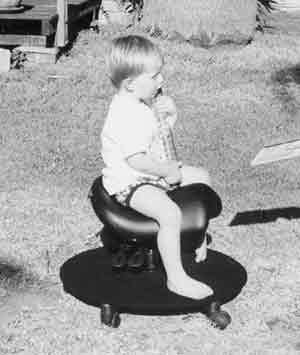 Young child in a Bambach Saddle Seat with a Foot Platform. 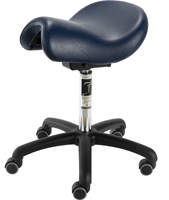 The Bambach Saddle Seat facilitates good posture when reaching forward. 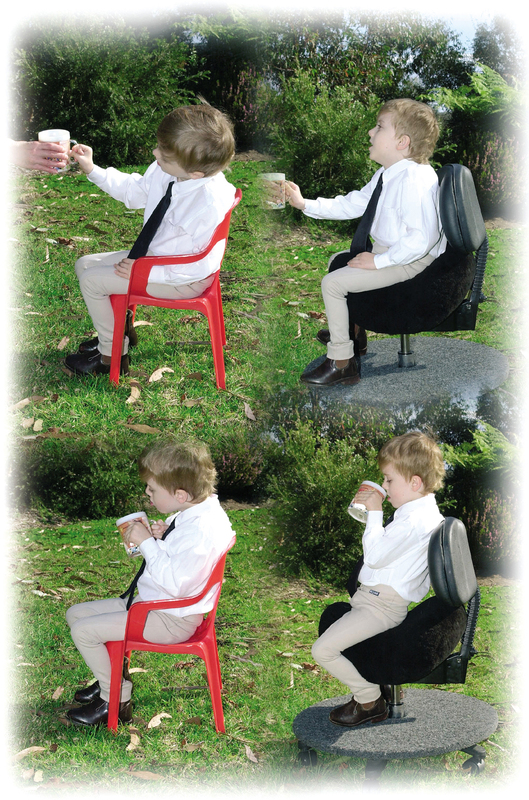 Includes durable 5-star nylon chair base with large 60mm casters for smooth rolling. Optional braking or locking casters are also available. The Bambach Foot Platform is used mostly by small or disabled children under 4' tall and therefore the very lowest gas stem is usually recommended. The top of the Foot Platform is about 6.5" higher then the floor. The Foot Platform can be removed when the child grows. With the Foot Platform removed the low lift will fit individuals from 4' to 5'2" (seat height 18.5"-23" above the floor). Large 60 mm diameter chair caster rolls more easily than smaller standard chair casters. Available with hard tread for carpeted floors or soft tread for hardwood and tile floors. Full hood. A toe-brake completely locks the caster wheels to prevent a chair from rolling. Recommended for precise hand tasks. Also used for children and disabled people. Available with hard tread for carpeted floors or soft tread for hardwood and tile floors. 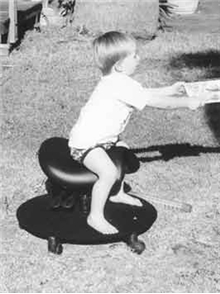 For standard use, Health by Design warrants to the original purchaser that the Bambach Saddle Seat shall be free from defects in material and workmanship for 5 years. Normal wear or abuse of upholstery is not covered. This warranty is void if the product has been defaced, changed, or tampered with or improperly used or installed or if the claim arises from damage or loss during shipment. All other warranties express or implied, whether arising by virtue of statue or otherwise are excluded. For continuous 24-hour use, for example multi-shift applications, Health by Design warrants to the original purchaser that the Bambach Saddle Seat shall be free from defects in material and workmanship for 2 years. Normal wear of upholstery is not covered.